According to the 2008 Index of Economic Freedom, Kuwait has the second-most free economy in the Middle East. In March 2007, Kuwait's foreign exchange reserves stood at US$213 billion. The Kuwait Stock Exchange, which has about 200 firms listed, is the second-largest stock exchange in the Arab world with a total market capitalization of US$235 billion. In 2007, the Kuwaiti government posted a budget surplus of US$43 billion. Kuwait has a proven crude oil reserves of 104 billion barrels (15 km³), estimated to be 10% of the world's reserves. According to the Kuwaiti constitution, all natural resources in the country and associated revenues are government property. 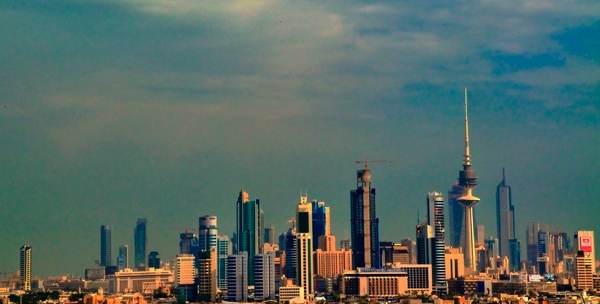 Being a tax-free country, Kuwait's oil industry accounts for 80% of government revenue. Petroleum and petrochemicals accounts for nearly half of GDP and 95% of export revenues. Increase in oil prices since 2003 resulted in a surge in Kuwait's economy. Kuwait's current oil production of 2.8 million bpd is expected to increase to 4 million bpd by 2020. To realize this production target, Kuwait Petroleum Corporation plans to spend US$51 billion between 2007 to 2012 to upgrade and expand the country's existing refineries. However, the country's economy was badly affected by the global financial crisis of 2008. In 2009, the Central Bank of Kuwait devised a US$5.15 billion stimulus package to help boost the economy. Other major industries include shipping, construction, cement, water desalination, construction materials and financial services. Kuwait has a well developed banking system and several banks in the country date back to the time before oil was discovered. Founded in 1952, the National Bank of Kuwait is the largest bank in the country and one of the largest in the Arab world. Other prominent financial institutions based in Kuwait include the Gulf Bank of Kuwait and Burgan Bank, which is named after the largest oilfield in the country. Kuwait's climate limits agricultural development. Consequently, with the exception of fish, it depends almost wholly on food imports. About 75% of potable water must be distilled or imported. The government is keen on decreasing Kuwait's dependence on oil to fuel its economy by transforming it into a regional trading and tourism hub. The planned US$77 billion Madinat al-Hareer (City of Silk) is the largest real estate development project in the Middle East. The Central Bank issues Kuwait's currency, the Kuwaiti dinar. As of December 2007, the dinar was the highest-valued currency unit in the world. On January 5th,2010,Kuwait has started the construction of Salmiya Park.The Heads said "it would take atleast 4 years to complete Salmiya Park"